Joe Diebes: From 1996-2003 Joe Diebes was a core member as well as the musical force behind the hybrid arts group GAle GAtes et al. 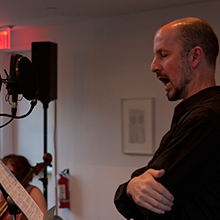 Since then he has continued to create performance work that fuses sound, visual media, and the human voice into a unique form of contemporary opera. His opera, STRANGE BIRDS, received its U.K. premiere in 2005 at Tramway (Glasgow) and his sound-theatre collaboration with Phil Soltanoff, I/O, was presented at Fusebox (Austin 2007) and Theatre Garonne (Toulouse 2008). He has also exhibited internationally his sound installations, video, and works on paper for art galleries, museums, and public spaces including Paul Rodgers/9W (New York), The ’06 Olympics (Torino, Italy), Yuanfen Gallery (Beijing), and the Liverpool Biennial. Christian Hawkey is the author of three books of poetry. His first book, The Book of Funnels, appeared in 2004 and won the Kate Tufts Discovery Award. His second book, Citizen Of, was released by Wave Books in the spring of 2007, and received enthusiastic reviews from numerous magazines and online journals, including Time Out New York, Octopus, and the New Yorker. His third book, Ventrakl, is a trans-genre exploration of the life and work of the late 19th, early 20th century Austrian poet Georg Trakl, and it was released by Ugly Duckling Presse in the fall of 2010. He’s also written three chapbooks: HourHour, which includes drawings by the artist Ryan Mrozowski (Delirium Press, 2005); Petitions for an Alien Relative (Hand Held Editions, 2009); and Ulf (Factory Hollow Press, 2010). His work has appeared in Conjunctions, Volt, Denver Quarterly, Tin House, Crowd, BOMB, Chicago Review, Best American Poetry, and Conduit, and his art criticism has appeared in frieze and Meatpaper. He also translates contemporary German poetry, and he co-translates, with the German poet Uljana Wolf, the Austrian writer Ilse Aichinger. Awards include: an Academy of American Poets Prize, the Poetry Fund, a 2006 Creative Capital Innovative Literature Award, and a 2008 DAAD Artist-in-Berlin Fellowship. His work has been translated into 13 languages. David Levine’s performance, photography, and video work has been seen at MoMA, Documenta XII, Mass MoCA, The Townhouse Gallery (Cairo), HAU2 (Berlin), and PS122 (New York), The Watermill Center (Water Mill, NY), and featured in the New York Times, Artforum, TDR and The Believer. He has directed theater at the Vineyard, the Atlantic, and Primary Stages in New York. In 1992, the music industry was rocked by scandal. International pop duet Milli Vanilli were caught lip-syncing months after collecting a Grammy for Best New Artist. Five years later, their awards revoked, their recordings destroyed, their money gone, singer Rob Pilatus died of a drug overdose in Cologne. The story is classically operatic: a Faustian bargain, a public disgrace, theft of the human voice. But it is also contemporary: technology and human song; the fate of artistic ambition in the age of mechanical reproduction. Composer Joe Diebes, poet Christian Hawkey, and director David Levine are creating a contemporary opera exploring these themes, and the first stage of development work will be done at Watermill. This opera will be experimental and non-linear, but written for trained singers and opera houses. It will engage both the expressive capacities of the human voice and the emotive capacities of technology. It will explore race (one singer was black, one white), nationality (German pop stars, ruined in America), and sexuality (the manufacture of pop androgyny) and the formal relations of opera and pop: two men sell their voices for fame and fortune, only to be ruined when they demand their voices back. Central to the piece is a tension between what audio recording can do and the value of musical talent. The opera, like its subject, will be bilingual, containing English and German elements.